A friendly affordable Bridal boutique in Stockport, Manchester. A how to guide for brides! How to buy a wedding dress? Wedding dress styles and more! Robin's gorgeous fishtail weddding dress with tulle detailing from the How I Met Your Mother wedding season still takes our breath away. For a similar silhouette with a bit more sparkle, try Mori Lee Keira 5601. We also offer a range of sparkly belts just like hers for a wedding dress glow up! Blair's iconic wedding to Chuck was the perfect end to the series. She broke tradition with a blue illusion lace long sleeved bateau wedding dress with stunning crystal detailing. For a similar look in a more traditional colour we have Mori Lee Karlee 8207 in store. Rachel's tea length satin wedding dress on Glee screamed Audrey Hepburn to us, which was more than appropriate! Styled with a cute double tier veil for an old Hollywood wedding look. Even though it's been 17 years (!!!) 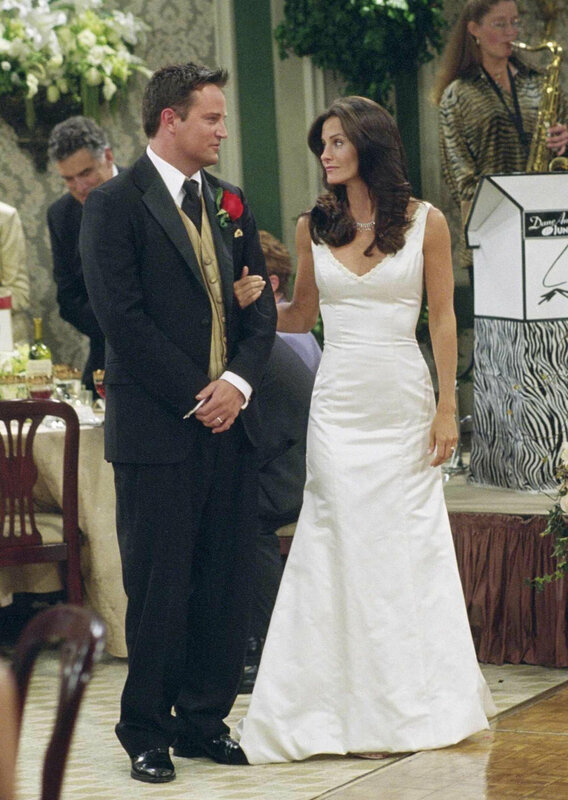 since Monica and Chandler's wedding in Friends, her elegant Mikado satin wedding dress is back in fashion for 2019/20. For an updated version try Sincerity 3958. OK so technically it wasn't a real Riverdale wedding but Veronica's illusion lace wedding dress with a ballgown skirt was a dream come true for some of us! ( #Varchie ) She even teamed it with a cute and understated tiara. Sincerity 1142 is a perfect dupe dress and we have a range of tiaras and headpieces to go with it! Wedding dresses and Bridesmaids dresses.